The 2nd Race of the Sunday Series III saw an amazing turnout of 22 boats on the Start-line, looking like a dry run for the Ambassadors Cup this November. The wind did not disappoint as well, as a building east-southeasterly breeze took sailors on a long beat to North Angler Buoy and back on a spinnaker run. Witblits conquered the largest fleet of competitors on Sunday, finishing ahead of 6 other Cruising Multihulls to clinch their first bullet for the Sunday Series III. It was certainly commendable, as Skipper Shaun Norris sailed with only 2-up in a breeze consistently above 10 knots. Same goes for 2nd placed Jaza Too, who were also only 2-up, but looking very comfortable ahead of the pack. Miss Visayan continue their good performance to finish in 3rd, producing consistent results over the past 2 weekends. 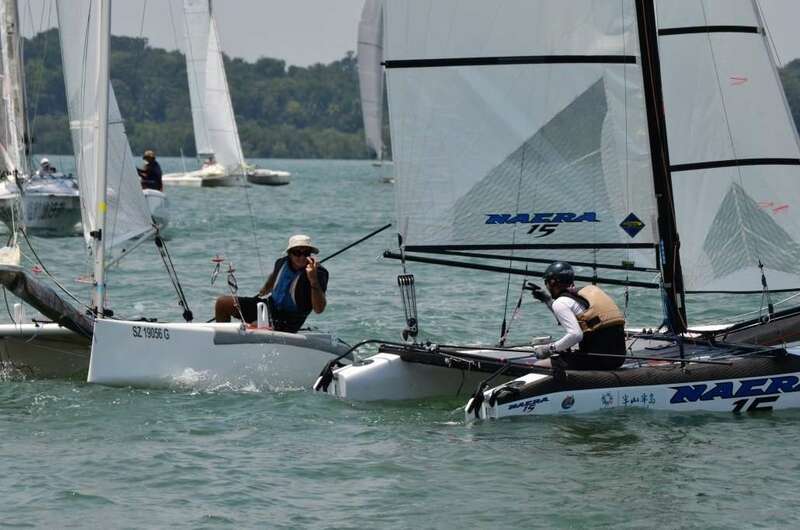 In the Beach Catamaran Class, Scott McCook returns to racing on a Viper F16 with new sails. Sailing solo, he displayed a convincing performance to sneak ahead of the young guns on Madfish II to finish first. Despite crossing the line just seconds behind the Viper, The lone Taipan Stray Catz had to settle for 3rd on handicap. Damages to their headsail resulted in a premature end for Bad Influence, forcing them to retire from the race. Both Sangaree and Temptress of Down took full advantage of the unfiltered winds, taking first and second in the PY Class. With Skipper John Boers absent, Xenia helmed Sangaree to their second consecutive bullet in the series, putting them in the driving seat. Despite losing control of their spinnaker on the last stretch down to the club line, Minx recovered and sailed well enough to secure their place on the podium in 3rd. Some stiff competition between the 30-40 footers in the IRC Class took place – with the Italian Stallion Shardana emerging victorious to make it 2 bullets out of 2 races. Competition was so close between 2nd and 3rd place, as Born in Fire placed ahead of Red Rum by a mere 5 seconds after corrected time! Fantastic weather, excellent turnout, thank you all for joining us over the weekend!